New technology brings us all closer to those we know and love, but what happens if your device won’t tell you about a new message? Would you miss an important work notice? Or perhaps an urgent message from a family member? Either way, that is almost unthinkable in the modern tech-centric world in which we live. This article is designed to teach you to turn on new message notifications on your iPhone or iPad. Apple devices come with a ‘Do Not Disturb’ feature which can be turned on or off for all of your contacts. This means that if this feature is enabled, you would not receive any notification that you have a message. Go to your device’s settings, and find the ‘Do Not Disturb’ menu. You will see a field named ‘Manual’. Make sure the slider is moved to the left-most position, or that it is in the ‘off’ position. 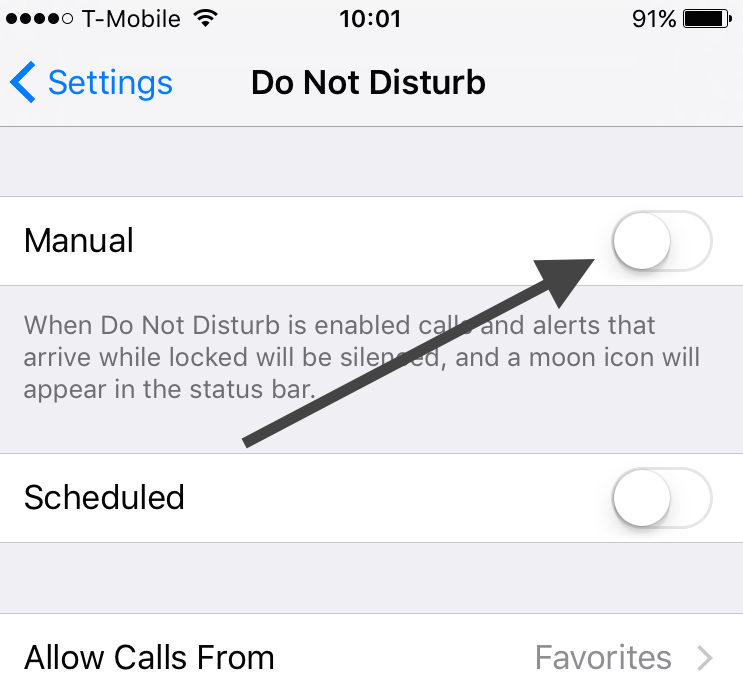 Your Apple device also allows you to engage the ‘Do Not Disturb’ feature for any single contact as well. If, after checking the master setting, you still do not get new message notifications, check the individual setting. Navigate through your contacts list, and see if anyone has a half-moon icon next to their entry. The half-moon icon means this individual contact has ‘Do Not Disturb’ enabled for just them. Edit that individual contact, and find their individual ‘Do Not Disturb’ setting (notifications > messages), and turn ‘Allow Notifications’ to ‘On’. The problem may be even more simple than a setting; it might just be your ring/silent switch! This switch, as the name suggests, toggles your phone between ‘silent’ and ‘ring’ modes. On your iPhone this switch is located on the left-hand side of your device. On your iPad the switch is located on the right-hand side of your device. If your device is in ‘silent’ mode, simply switch it to ‘ring’ mode after you have assured your ‘Do Not Disturb’ settings are correct. If this does not work at first, try toggling the switch back and forth a few times and try again. With this feature the name says it all; volume control allows you to control the volume of your Apple device. If you have tried the others fixes on this list, yet still aren’t getting the right results, check your volume. The volume control button is located on the left-hand side of your iPhone, just underneath the ring/silent switch. For iPad users, check on the right-hand side of your device. Some users accidentally change the sound setting by inadvertently pressing this button. Make sure your device is set to a volume which is loud but still comfortable to hear. If the above solutions have not helped, you can always reset your network settings, and restart your device to solve the problem. This will change your settings back to the way they were when your device was brand new. Go to your settings and find the field named ‘General’, then the section named ‘Reset’. Under ‘Reset’ find ‘Reset Network Settings’, and confirm your decision when prompted. To restart, find the Sleep/wake button (iPhone on right-hand side, iPad on top of device), and hold down until prompted with a red ‘Slide to Power Off’ message. Slide the red slider, and wait a few seconds before powering back on. Press and hold Sleep/wake button to power back on. Your Apple device is loaded with great features to bring your world closer. Sometimes, however, having so many features can be confusing! We hope this article was helpful, and that you can get back to enjoying your iPhone or iPad (or both! ).